Cracking your knuckles or leaning over in your chair to crack the joints in your back may feel good in the moment, but too much of a good thing may be detrimental to your overall joint health. Scott & White orthopedic surgeon, Russell J. Clark, MD, dispels some myths about “popping” your joints and explains what to do if you are having joint discomfort. 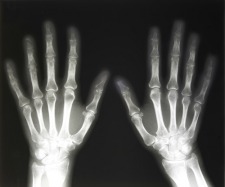 Most joints consist of two bones that contact each other at their cartilage surfaces. The cartilage surfaces are surrounded by a joint capsule consisting of a network of ligaments for stability. Inside the joint capsule is a liquid, known as synovial fluid. The synovial fluid also contains dissolved gases, including oxygen, nitrogen and carbon dioxide. Is it okay to “pop” your joints? It is unlikely that joint-cracking is a significant cause of arthritis or damage, the orthopedic surgeon said. There are some instances where joint cracking could be a sign of a more serious medical condition, but most of the time popping a joint is not something that needs to be addressed. People who pop their back or neck are doing the same thing to those joints. “The spine has a series of small joints called facet joints that can be popped by taking them to the end of their range of motion quickly” he said. The same principle applies to these joints as well—it’s better not to repeatedly crack them for fear of stretching the ligaments. Can chiropractic adjustments be harmful to joints? “There have been some reports of some chiropractic treatments being harmful, but these are few and far between,” Dr. Clark said. Chiropractic treatments can actually be helpful for some musculoskeletal conditions that cause muscle spasms or cramping around the back and neck. But the orthopedic surgeon warns that the treatments may only provide temporary relief. What should a patient do if they are experiencing joint discomfort after cracking their joints? These physicians can order an X-ray and decide if conservative treatment or referral to an orthopedic surgeon is most appropriate. Previous Previous post: How safe is a blood transfusion?